Taking its inspiration from ‘The Shadow Followers’, a piece in the exhibition of new work by Pip Dickens, this workshop used layering and sequencing techniques to turn simple shadow screen images into narrative-rich photo art. 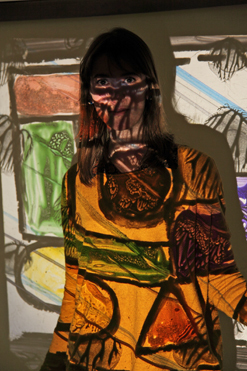 Participants invented their own multiple images by combining shapes and patterns with digital slide projections and silhouette profiles. A Victorian magic lantern was used to project painted slides, creating further effects.